So, we bring you the MINI Feedback Synth! Same basic Atariesque noise quality with less calories. You still get two patch points for integrating with other gear, using as touch points, etc. I may make other options such as power starve, 2nd range switch, Photo resistor optional so you can customize your unit to your tastes and budget. The stock unit is fun as hell as is however. 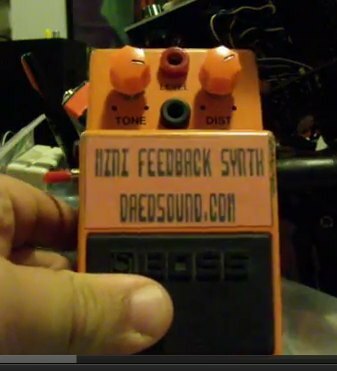 The prototype was built into an old Boss pedal shell I had sitting around the lab. Production models (if there is enough interest) will probably be built into small stomp box cases or perhaps some interesting alternative toys, plastic buckets, etc. The nice thing about building it into a stomp box is I can install a stomp switch to turn it on/off with your foot which I think should make it a bit more useful to guitarists or those who want some chaos without having a table 'o' gear to set up each gig. Price TBA. "Feedback" always welcome!